MOSCOW, Russia -- Ukraine’s parliament called on authorities Tuesday to investigate the country’s imprisoned former prime minister on high treason charges, adding to the legal woes of the onetime Orange Revolution leader and chief political rival of President Viktor Yanukovich. 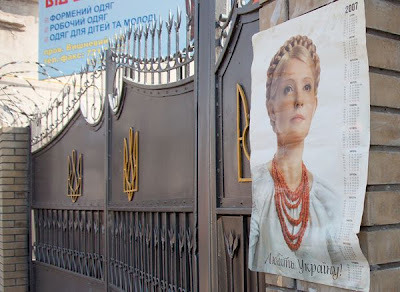 Tymoshenko poster in front of the ex-Premier's jail. The Supreme Rada voted to back a commission report that accused Yulia Tymoshenko of showing “signs of state treason” when she signed a 10-year gas deal with Russia in 2009. The charismatic 51-year-old Tymoshenko, popularly known as the Orange Princess for her leading role in the country’s 2004 peaceful revolution, is already serving a seven-year prison term. The sentence was imposed last October after she was convicted of abusing the powers of her office by signing the oil deal, which cost Ukraine $1.5 billion in damages, according to the verdict. The case has been widely condemned inside and outside of Ukraine as a politically motivated attack on a rival by Yaukovich’s administration. “The documented evidence we uncovered and worked with clearly implicate Tymoshenko of acting contrary to the national interests, driven by her personal political ambitions and material interests,” commission chief Inna Bogolovskaysa said in a phone interview. At the time Tymoshenko signed the oil deal with Moscow, the company she once ran owed Russia more than $405 million and Russian prosecutors were investigating possible bribery charges against her, Bogoslovskaya said. If found guilty on the new charges, Tymoshenko -- who lost the 2010 presidential election to Yanukovich on a narrow margin -- could face an additional 15 years in prison. The parliamentary action came two weeks after a top prosecutor suggested that Tymoshenko might be tied to a 1996 contract killing of a lawmaker, his wife and aide. Tymoshenko’s allies say recent events were a sign that the Yanukovich camp is determined to sideline a still potent opponent. “These are just new steps in the ongoing campaign by Yanukovich and his party aimed at further discrediting Tymoshenko as they are still terrified of their main political rival even if she is still in prison,” national lawmaker and Tymoshenko ally Natalia Korolevskaya said in a phone interview. Korolevskaya said she did not know Tymoshenko’s reaction to the news from parliament but added that the jailed politician didn’t expect any other outcome from the Legislature controlled by Yanukovich’s Party of Regions and its allies. Tymoshenko is being held at a prison outside the industrial center of Kharkiv, about 250 miles east of Kiev, the capital of Ukraine. She is suffering from severe problems with her spine and other ailments that require treatment at a medical facility outside the prison, Korolevskaya said, a move refused by the authorities. Tuesday’s vote sets the tone for parliamentary elections in October and also might be an attempt to counter a European Court of Human Rights decision expected later this year on the Tymoshenko case that might compel authorities to free her, said Vadim Karasyov, director of the Institute of Global Strategies, a Kiev-based think tank. “Yanukovich is still trying to prove to Ukraine’s voters and the rest of the world that Tymoshenko was really guilty and keeps backing up his case with new evidence,” Karasyov said by telephone from Kiev. At the same time Ukraine, which pays the biggest price from Russian natural gas in Europe, is negotiating potential gas deals with Slovakia, Turkey, Azerbaijan and Turkmenistan, Karasyov said.